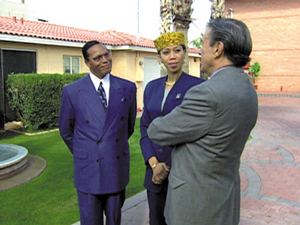 Minister Louis Farrakhan, left, Attalah Shabazz, oldest daughter of Malcolm X, and Mike Wallace of CBS' "60 Minutes," are seen at the home of the Honorable Elijah Muhammad in Phoenix, Arizona on April 1, 2000. CHICAGO (FinalCall.com) - Media mischief makers are attempting to do to him what has been done to every outspoken Black leader who has had the ear of the masses—destroy his good name and ultimately kill him, the Honorable Minister Louis Farrakhan charged May 14 during a series of media appearances. To make things worse, they are using old distortions to do it, he charged. Minister Farrakhan made the remarks to FOX television, a local CBS news affiliate, the Chicago Defender, a Black daily newspaper, and CNN in response to the media’s handling of a press release from CBS’s 60 Minutes program about a May 14 show featuring the Minister. The 60 Minutes press release headlined that Minister Farrakhan "admits for the first time his words played a role leading to the murder of Malcolm X." Interviewed for more than four hours by 60 Minutes reporter Mike Wallace and Attalah Shabazz, daughter of Malcolm X, Minister Farrakhan discussed a variety of issues, particularly the reconciliation effort between his family and the family of Malcolm X over the last five years. The interview was taped at Minister Farrakhan’s residence in Phoenix, Az., and the actual broadcast lasted approximately 12 minutes. "My concern is the mischief of the media to say that Louis Farrakhan admits complicity to the murder of Malcolm X when it’s well known that Malcolm X and I were in a heated controversy over the morals of the Hon. Elijah Muhammad," Minister Farrakhan said. "This created an atmosphere, unfortunately, that led to the assassination of Malcolm X. "It’s known that I had nothing to do with the assassination of Malcolm X and there’s no statute of limitation on murder. But I’m being treated in the media in a mischief-making attempt … to turn the people against me," he said. The attacks started May 10 when the Associated Press rejected a request from 60 Minutes to embargo the press release until the next day when the Black weekly newspapers would carry the story. The headline of the AP news story said, "Farrakhan admits complicity in Malcolm X’s murder." Minister Farrakhan has noted in several of his past speeches dating back a decade that some of his words, the words of others, and Malcolm X’s own words helped to create the atmosphere in which Malcolm X could be murdered. The outspoken leader fired back first on the "Tony Snow" news show aired Sunday mornings on FOX television. During the ten-minute segment of the national program, Minister Farrakhan explained that he did the 60 Minutes interview at the request of Attalah Shabazz to put on tape with Mr. Wallace the history of their wounds, agreements and disagreements. Qubilah Shabazz, daughter of Malcolm X and Betty Shabazz. He said the reconciliation effort began in 1994 when he and the Nation of Islam rallied to the support of Qubilah Shabazz—daughter of Malcolm X and the late Dr. Betty Shabazz—who was accused by the government of hiring a hit man to assassinate Minister Farrakhan. During the fallout of that case, Minister Farrakhan and the Black community charged the government with trying to set-up Qubilah by paying Michael Fitzpatrick (aka Michael Summers), a Jewish informant, $34,000 plus expenses to record conversations with the woman. 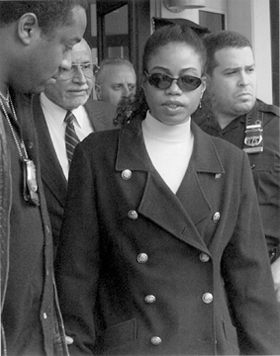 MinisterFarrakhan, in a Jan. 17, 1995 press conference at Mosque Maryam, called for a letter-writing campaign demanding that the charges be dropped and her unconditional release. The charges against Qubilah shortly thereafter were dropped. Mr. Fitzpatrick also under investigation for coin fraud, was financially bankrupt and suffered drug addiction, according to court records and media reports at that time. The reconciliation effort between Minister Farrakhan and Betty Shabazz continued during the build-up toward the Million Man March whose themes were atonement and reconciliation. Minister Farrakhan reminded Mr. Snow that Dr. Shabazz spoke at the March and that some of her daughters also attended. 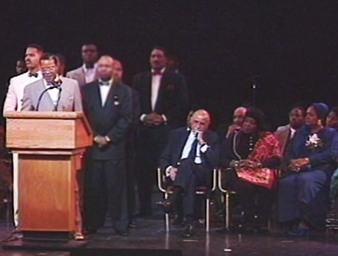 Minister Farrakhan and Dr. Betty Shabazz appear together in historic 1995 event held at the Apollo Theater in Harlem, New York. Responding to a question about activities of the FBI with Black leaders, Minister Farrakhan referred to the government’s Church Committee Report which highlighted FBI efforts to destabilize Black groups and discredit Black leaders. Particularly, he recalled the efforts against Marcus Garvey, W.E.B. DuBois, Congressman Adam Clayton Powell Jr. and Malcolm X. In an interview with the Chicago Defender newspaper, Minister Farrakhan expounded on the government’s role in the destruction of Black leaders. "You must remember Paul Robeson and the media saying he was a communist and he was stoned (in New York). … The sad thing is that the effect of this has been the alienation of our people from leaders who loved us and fought for us. "I am hoping that the mischief of the media will not be to the alienation of our people, Black people, from Louis Farrakhan, who has been and is and will continue to be a fighter for the total liberation of Black people from all forms of oppression," he said. The motivation for the interview with Mr. Wallace and Ms. Shabazz was that she wanted "to say things that were on her heart. She and her family have suffered much pain," Minister Farrakhan told John Davis, a Black reporter for a local CBS news affiliate. Through the years of dialogue, Minister Farrakhan said, he mentioned to Ms. Shabazz the fact that the Pope of Rome has asked Native Americans and other indigenous peoples to forgive the sins of the church. Ms. Shabazz pointed out to the Minister that he is in a similar position because he now sits in the seat of the Hon. Elijah Muhammad over the Nation of Islam. "I know that members of the Nation were involved in the assassination of Malcolm X and other anti-social acts that were against the teachings of the Honorable Elijah Muhammad. So I have asked for mercy of God and forgiveness of God for those acts by Muslims that were done out of their zeal and ignorance and I have asked our people for their forgiveness. And this is what is new in our dialogue," Minister Farrakhan told Mr. Davis. And despite the recent media controversy over the 60 Minutesbroadcast, Ms. Shabazz called him May 11 to wish him a happy birthday, the 67-year-old leader said. After a mid-morning Mother’s Day message to more than 500 women at Cook County Jail, Minister Farrakhan had his final interview of the day with Gene Randall on CNN. Responding to a question about a 1965 article he wrote inMuhammad Speaks newspaper saying Malcolm X was "worthy of death," Minister Farrakhan again pointed out that the critical part of the quote continues to be omitted when it is referred to and taken out of context. "The other part of the sentence said that, it would have been so ‘if it had not been for Muhammad’s confidence in Allah for victory over the enemies.’ So there was no threat against Minister Malcolm in those words, however, those who have used those words use half of the sentence" for the purpose of "discrediting me and the new Nation of Islam that has come up around me," he said. The concern of Ms. Shabazz about the interview was expressed during the actual 60 Minutes broadcast when she shared her feelings of anticipation and anxiety as she prepared to go to the interview. Ms. Shabazz said she prayed and included the names of her parents in her prayer. Nevertheless, the program focused primarily on historical background of the assassination and other events that demonstrated the threat to Minister Malcolm’s life. Completely lost in the broadcast is the effort of reconciliation between Minister Farrakhan and the late Dr. Shabazz, including a joint appearance at Harlem’s Apollo Threater to raise funds to defend Qubilah in the case of the government informant, which Mike Wallace attended. By the time the event was held, the government had dropped the charges and the funds were to go to the Shabazz family. Neither was there a mention of Dr. Shabazz’s speech at the Million Man March and the attendance of some of her daughters. While graphic footage of Malcolm X’s murder was prominent in the 60 Minutes broadcast, there was no mention that on the day of the murder, New York Police were ordered to pull back the usual contingent of officers that would monitor such events. Also, records show that an undercover police agent on Malcolm’s security team gave mouth-to-mouth resuscitation to the fallen leader. Furthermore, the late attorney William Kunstler, who represented the Shabazz family over the years, told The Final Call in an interview that he had taken an affidavit from Talmadge Hayer, one of the three convicted assassins, in which Mr. Hayer described in detail who killed Malcolm X and named the murderers. On March 30, 1998, Muhammad Abd Al-Aziz, then captain of Muhammad Mosque No. 7 in Harlem, stood on the steps of the mosque and proclaimed his innocence in the Malcolm X murder. With members of the Nation of Islam around him and a barrage of reporters and film crews documenting his words, Mr. Al-Aziz (aka Norman 3X Butler), who served 20 years for the murder, said he had voluntarily submitted to an independent professional polygraph exam. "I had nothing whatsoever to do with the assassination of Malcolm X. I have been falsely accused, unfairly convicted, and unjustly imprisoned—over 20 years—for a crime I did not commit," he said.